﻿Do you remember what you did you on the evening of 13 January 1972? A multitude of Japanese jazz lovers walked or drove to the grand Shibuya Public Hall in Tokyo where they enjoyed a veritable firework display of a concert, which was – without exaggeration – a milestone in the history of jazz. The technicians from the Japanese subsidiary of Columbia, Sony, had placed their microphones and tape machines with great care and captured this memorable concert live. Two of the numbers had already been recorded in New York with the same group of musicians for the album "I Sing The Body Electric". 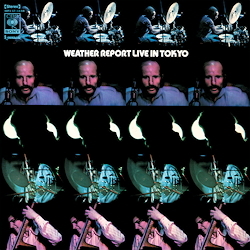 But to experience Weather Report live with this ensemble was only granted to the enthusiastic Japanese jazz fans. The concert programme consisted of long medleys composed by Wayne Shorter and Joe Zawinul, which were dissected and put together again with interplay between the rhythm group and the soloists. Wayne Shorter, who plays the tenor and soprano saxophone and the virtuoso Joe Zawinul, who loved to alternate between the acoustic and electric piano, were quite rightly awarded with frenetic applause from the audience. The most recognizable numbers are probably "Doctor Honoris Causa", (which Cannonball Adderley also often liked to perform this in public), and "Directions" (just listen once again to the version which Wayne Shorter recorded with Miles Davis!). Most of today’s vinyl fans will have missed out on the tour back then. That’s why it is especially pleasing that this live event is available once again as a vinyl double album. And what is more: one can enjoy an enhanced sound thanks to the superb reproduction techniques of the 21st century.